Here’s another very interesting project to come out of the 4 Minute Mile challenge — pneumatically boosted legs. It’s another project by [Jason Kerestes] in cooperation with DARPA. We saw his jet pack a few days ago, but this one looks like it has a bit more promise. It is again a backpack mounted system, but instead of a few jet turbines, it has a pneumatic cylinders which move your legs for you. Just watching it it’s hard to believe it makes it easier to run, but apparently after being tested at the Army Research Laboratories last year it demonstrated a whopping 10% reduction in metabolic cost for subjects running at high speeds. It can actually augment the human running gait cycle, and is the only device the US Army has confirmed can do so. He is already hard at work designing version 2.0 which is lighter and more flexible. There’s a bunch of test videos after the break so stick around to see it in action. Kids’ fantasy figures are long overdue for some tech upgrades, so MAKE’s [Jeff Highsmith] carved a few holes in the walls and built a pneumatic transport system for his children to deliver their teeth to the Tooth Fairy. The project uses a system of 1.5″ PVC pipe with a central vacuum in the attic and two endpoint stations, one in each child’s room. Alternating which station has the closed valve and open door dictates the airflow path and shuttles a small plastic travel bottle from one station to the next. Each station has its own iPhone interface that sends data to a Raspberry Pi and relays information, including a simulated map indicating the travel path taken by the tooth. Apart from controlling the vacuum via one of the Pi’s GPIO, the phone serves primarily as a visual distraction for the children while one parent sneaks off into the other room and replaces the tooth with some pocket change. [Jeff] made sure to add a locking door on each station to limit access and hopefully keep the mystery alive. Watch his son’s face light up with sheer glee at the whole event in the video below, and regret that your childhood happened before the maker revolution. Then celebrate your adulthood with a beer fetching robot. A real car remote controlled with an Arduino… what could go wrong? 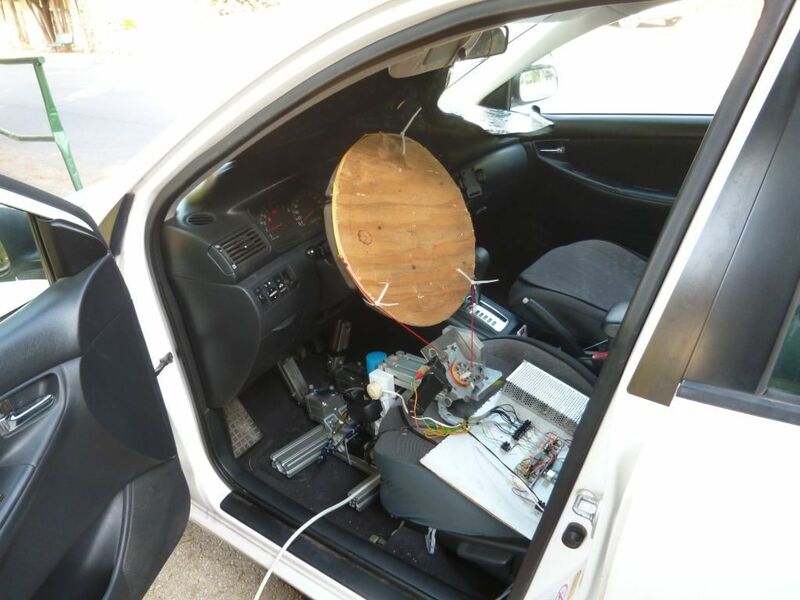 [Gilad] tipped us about his latest project, where he adds plenty of pneumatics and electronics into his wife’s car to remote control it. The brake/throttle pedals are actuated by pistons controlled by electronic valves, and a standard DC motor is in charge of turning the wheel. The Arduino code tells us that the valves will be opened as long as the remote up/down channel is above/under given values. The frame is based on Festo aluminium profiles and we’re not sure where the mains used for the DC/DC converters is coming from. As the valves use 24V and the motor 12V, standard N-Mosfets and power relays are used for voltage conversion. The remote controller [Gilard] used is actually 20 years old, so the output signal of the receiver isn’t actually really clean. We do hope to never see this car on the road….